Born at Rostkovo near Prasnysz, Poland, about 28 October, 1550; died at Rome during the night of 14-15 August, 1568. He entered the Society of Jesus at Rome, 28 October, 1567, and is said to have foretold his death a few days before it occurred. His father, John Kostka, was a senator of the Kingdom of Poland and Lord of Zakroczym; his mother was Margaret de Drobniy Kryska, the sister and niece of the Dukes Palatine of Masovia and the aunt of the celebrated Chancellor of Poland, Felix Kryski. The marriage was blessed with seven children, of whom Stanislas was the second. His older brother Paul survived him long enough to be present at the celebration of the beatification of Stanislas in 1605. The two brothers were first taught at home, the main feature of this early education being the firmness, even severity, of their training; its results were the excellent habits of piety, modesty, temperance, and submission. After this they were sent to Vienna with their tutor to attend the Jesuit college that had been opened four years before, reaching Vienna, 25 July, 1564. Among the students of the college Stanislas was soon conspicuous not only for his amiability and cheerfulness of expression, but also for his religious fervour and angelic piety. This spirit of devotion continued to grow during the three years he remained in Vienna. 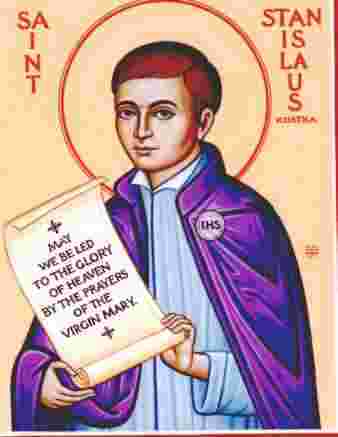 His brother Paul said of him during the process of beatification: "He devoted himself so completely to spiritual thing that he frequently became unconscious, especially in the church of the Jesuit Fathers at Vienna. It is true," added the witness, "that this had happened at home to my brother at Easter when he was seated at table with our parents and other persons." Among other practices of devotion he joined while at Vienna the Congregation of St. Barbara, to which many students of the Jesuit college belonged. If the confidences he then made to his tutor and later to a fellow-member of the Society at Rome are to be believed, it was Saint Barbara who brought two angels to him during the course of a serious illness, in order to give him the Eucharist. So much piety, however, did not please the older brother Paul; his exasperation led him to treat with violence the innocent Stanislas. The latter finally lost patience, and one night after Stanislas had again suffered the harsh comments and blows of his brother he turned on Paul with the words: "Your rough treatment will end in my going away never to return, and you will have to explain my leaving to our father and mother." Paul's sole reply was to swear violently at him. Meantime the thought of joining the Society of Jesus had already entered the mind of the saintly young man. It was six months, however, before he ventured to speak of this to the superiors of the Society. At Vienna they hesitated to receive him, fearing the tempest that would probably be raised by his father against the Society, which had just quieted a storm that had broken out on account of other admissions to the Company. Stanislas quickly grasped the situation and formed the plan of applying to the general of the Society at Rome. The distance was five hundred leagues, which had to be made on foot, without equipment, or guide, or any other resources but the precarious charity that might be received on the road. The prospective dangers and humiliations of such a journey, however, did not alarm his courage. On the morning of the day on which he was to carry out his project he called his servant to him early and told him to notify his brother Paul and his tutor in the course of the morning that he would not be back that day to dinner. Then he started, taking the first opportunity to exchange the dress of gentleman for that of a mendicant, which was the only way to escape the curiosity of those he might meet. By nightfall Paul and the tutor comprehended that Stanislas had turned from them as he had threatened. They were seized with a fierce anger, and as the day was ended the fugitive had gained twenty-four hours over them. They started to follow him, but were not able to overtake him; either their exhausted horses refused to go farther, or a wheel of their carriage would break, or, as the tutor frankly declared, they had mistaken the route, having left the city by a different road from the one which Stanislas had taken. It is noticeable that in his testimony Paul gives no explanation of his ill-luck.